Last week, DC Comics's Superman: Lois and Clark reached its midway point, giving some big clues as to the endgame for both Intergang and the mysterious woman recently outed as Hyanthis. We also, in the last two months, have got our first looks at Hank Henshaw's new abilities, Superman's new Fortress/workship and a dangerous new villain called Blanque. Writer Dan Jurgens joined ComicBook.com to discuss the last couple of issues, and how they're going to play into what you se next. Reminder: Spoilers ahead. 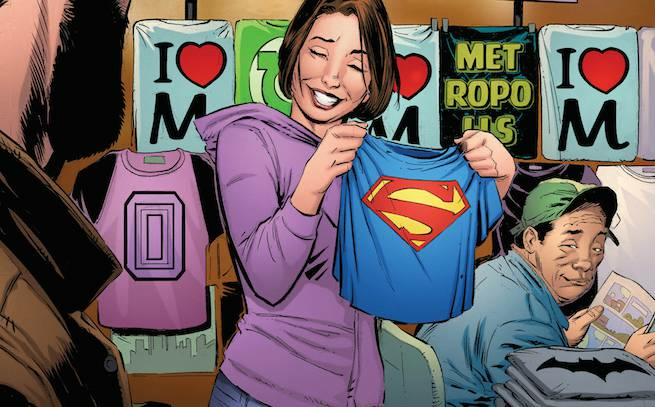 If you haven't yet read Superman: Lois and Clark #3 and #4, you can pick them up here and here, respectively, and read along with us. First off, in the time since we spoke last, you revealed via Twitter that this series will only run for 8 issues. Is the plan to have one long storyline that will make a nice collected edition? I think that’s the best plan for any limited series. And, yes, this will culminate with an ending that is very true to the characters and story overall. I’m quite happy with what we’ve done and where we’re going. Can you say yet whether you (or DC) have longer-term plans for Superman, Lois and Jon once the series is over? Right now, my focus is entirely on these characters and this story. It’s an important story for the Superman mythos and I want to make sure it’s as good as it can be. Okay, into the stories proper: In a world where the community is basically just wiped off the map and both Superman and Blanque vanish, is the Rusty Ridge massacre something that we’ll be coming back to? It seems like it would be something that concerned authorities. I have a couple of ideas on how to refer to it and certainly hope to do so. It’s certainly of interest to Joshua Chambers, who we met in issue 2. We’ll see him again as someone who’s investigating these unexplained events, and looking into the idea that they’re connected. Do you have a specific backstory and power set worked out for Blanque? If so, is it something we’ll see? Yes, I do have his backstory planned out and hope to get to it one day. There are, in #3 and #4, a handful of very nice shots of Superman and Lois together on a plain white background. How much of that is scripted and how much of it is Lee? The mirroring works nicely for me. That’s all Lee. It’s something I do a fair amount of myself, when I draw. One of the great aspects of working with Lee is that we think very much alike when it comes to what we like in comics. He is an impeccable storyteller who is able to portray the power of Superman and emotion of the quiet scenes with equal skill. How are they going to explain to Jon that the car went to the shop and never came back after it got trashed in the Fortress? Believe it or not, I have a story for that! He built his own version of an artificial intelligence system, which he named “Kelex” out of a feeling for what he left behind. The Fortress, in general, is not only practical but exemplifies Superman’s need to retain some aspects of the life he knew. Does Lois know about the Fortress? I can’t totally tell given the way they talk about Henshaw in #3. Yes, Lois knows he has a place. When I was a kid, one of my best friends was a kid whose father was a plumber. He had a massive workshop out in the back yard that was distant and separate from the house. It was like an alien place to us— a place of adventure with magnificent tools and the types of things you just didn’t see anywhere else. It was a work place, very separate and different from what the house, which was about 50 feet away, reflected. So, in a way, I think of Superman’s fortress like that as well. It’s his work shop— a place where he puts stuff that would otherwise be a problem. As testament to that, we saw him fight Shockwave in the flashback portion of issue 2. When he walks the through the Fortress in #3, in the present, Shockwave’s armor is there, as is Blanque. Do those Jor-El and Lara statues tell us something about what “version” of the post-Crisis, pre-Flashpoint Superman we’re dealing with, or are they kind of purposefully not helpful in that way? In a somewhat subtle way, it tells us a lot. Is that the head of the Iron Giant, or is it the Iron Giant-like robot from Ron Marz’s Adventures of Superman story? In the panel where Henshaw first wakes up, with all the cables and everything…is that intentionally evocative of the poster insert from Superman #78? Yes. Were I to be accused of toying with the readers as I try to tantalize them, I’d have to plead guilty. Two panels later, meanwhile, really reminds me of the cover of Adventures #468. Again, very much a part of the effect we’re going for here. It all gets down to, “Is this Hank Henshaw essentially the same or not?" It seems that Henshaw has similar powers, but not totally the same. Are we going to get an explanation for what happened to him, where, and what he can now do? In part, yes. But I also think this is a good place to let things unfold slowly. Can you tell us anything about some of those Fortress prisoners? I can tell you that you’ll find out more about them in issue #5. Has the solicitation text for #7 inadvertently given up the identity of the woman in shadows, or is there another surprise to come? It wasn’t inadvertent. I think it’s more important to recognize that we put some interesting twists to it keep people on their toes. I’m having a hard time picturing the hipster version of Bibbo who owns Ace o’ Brews. Who said Bibbo is a hipster? I mean, that would just go too far. Obviously, the scene in Cora’s office was HUGELY important, both to the Integrant story and to what’s going on with Jon. Is it just me, or has Jon just put something very big and important and potentially dangerous together? Has Jon put the pieces of the puzzle together? No. But he’s certainly accumulating those pieces.